With 8,000 Sq. 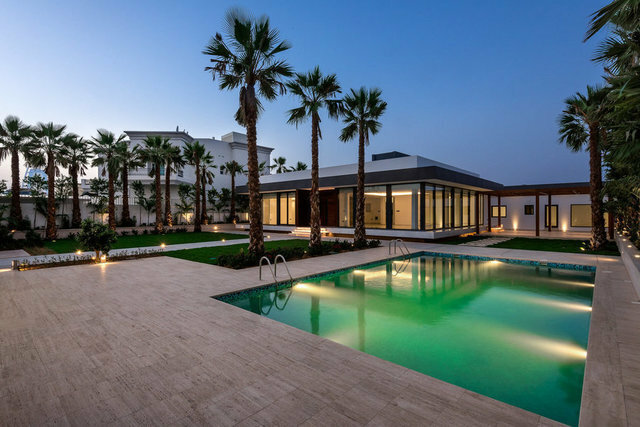 Ft. built-up area, this exquisitely designed contemporary villa located within walking distance to Jumeirah beach and affording views towards The Burj Al Arab exhibits the most luxury finishing.This four-bedroom, 5 bathroom luxury home stand on a plot in excess of 15,000 Sq. Ft. and offers contemporary open plan living for the modern family. The main body of the property is comprised of three large suites, open plan kitchen and dining area and large family room. To the rear of the property are several staff areas, large second full kitchen, laundry room and full guest suite. Located in the front garden area is a large room for your private gymnasium and spa. The landscaped areas of this home are simple and stunning with grassed decks, entertaining space and large private pool. Completing this beautiful home is a private 3 car garage and off road parking for an additional 4 cars. This truly is a stunning designed home for the discerning client.